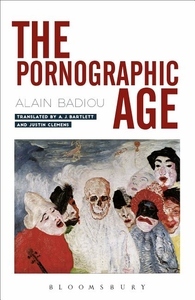 With The Pornographic Age, Alain Badiou offers a piercing indictment of what we have let ourselves become. This short, critical work, is a damning critique of the current age and of the democratic systems which characterize it. Badiou argues that any true radical politics must begin with dismantling the obscene (or pornographic) qualities of neoliberal capitalism. He asks us to hold up a mirror to ourselves and confront the debasement of the political realities in which we live and use the shock with which we must react to galvanize ourselves into action. It is only through this realization, this crucial confrontation with the perversity with which we conduct our daily lives that we can prompt true revolution. Accompanied by extensive commentary by experienced translators and Badiou scholars Bartlett and Clemens, this is philosophical call to arms: Badiou's radical indictment of the current age is an exciting, no holds barred, exploration of both how we live and how we might live.